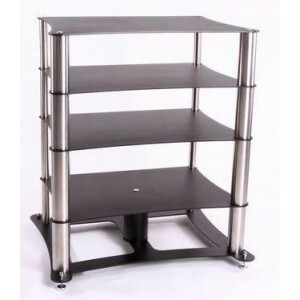 Custom Design manufacture an extensive range of loudspeaker stands, equipment supports and wall shelves. With over 30 years experience in manufacturing and designing, their attention to detail is superb. 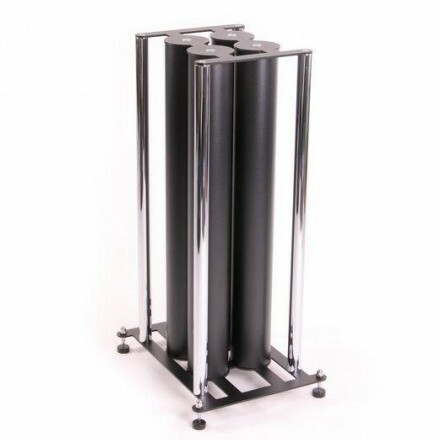 They offer a comprehensive range of both speaker stands and equipment supports with some particularly interesting products that I focus on. The Custom Design website obviously covers their full range, which I will not go into here, instead I am focussing on only their products that are relevant to Audio Therapy and its clients. 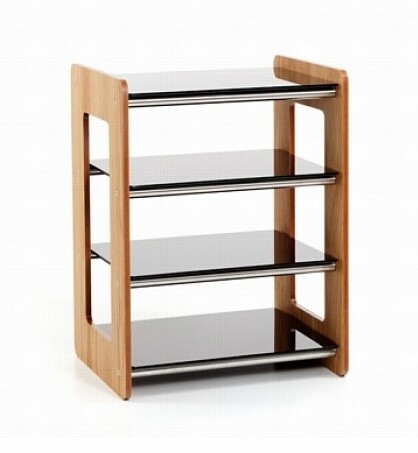 If someone likes the look of a product not mentioned on my website please let me know; I have access to whole range. Their range is fantastic in the sense that it looks great and because of the large range of finishes and styles available there are products that work visually in all room types, be it traditional or very modern. On more than one occasion a Custom Design stand has received spousal approval for an entire system that otherwise would not have been given! 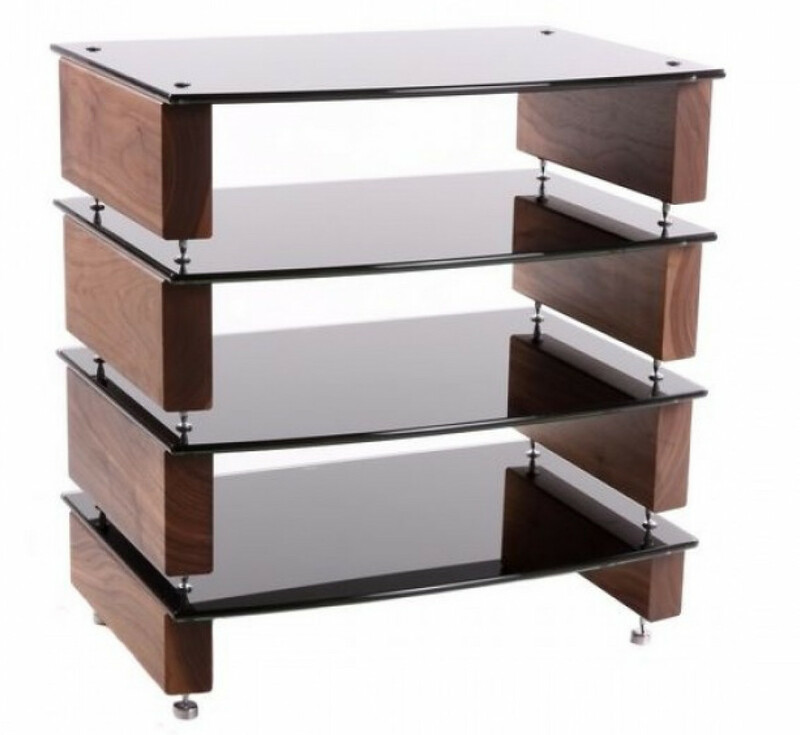 As I’ve mentioned on this site before, I’m not a huge fan putting a hi-fi on a glass shelf. It can add artifical drive and attack and it can quite often ring, which isn’t good for system performance in most instances. Wood can have the opposite effect; it can deaden the sound and make a system sound lifeless and uninspiring. 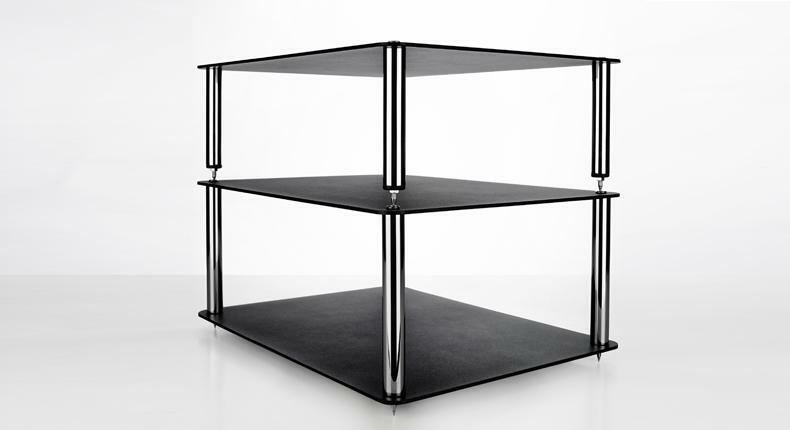 However, if you combine these 2 design features into one equipment stand the balance can work well, especially if you decouple the shelves from one another so there is minimal energy transferance between shelves. Custom Design also features in a number of their designs a material described as ‘acoustic steel’. 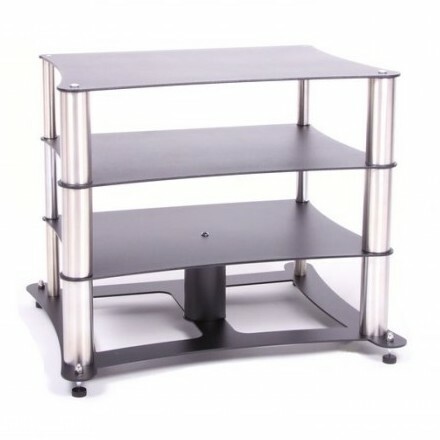 This is used in a number of products (top and bottom base plates on speaker stands and in specific equipment stands/isolation shelves). Acoustic steel works on the advanced principle of constrained layer dampening, which is basically two sheets of the same material, bonded together with a patented polymer system. The polymer’s viscoelastic property converts kinetic energy and resonance noise vibration into heat, thus preventing excessive resonance noise from affecting the performance of the system. This enhances performance, improving clarity and delivering more detail with improved separation complimented by better timing and control. 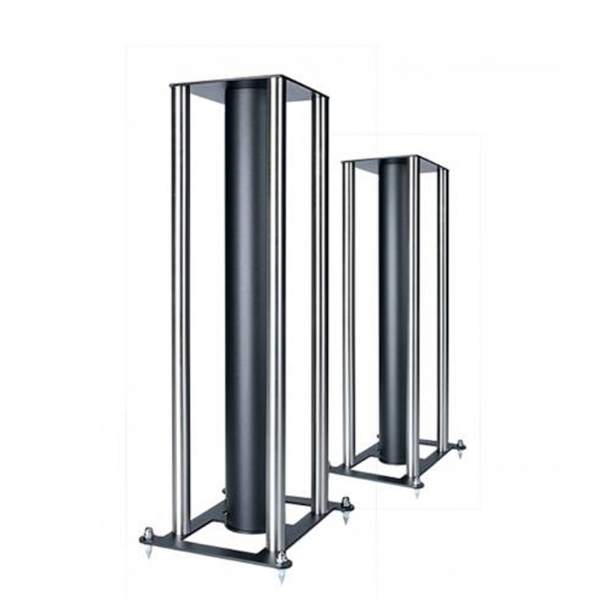 Acoustic steel works in 2 ways – it’s all about controlling unwanted energy. The bigger and better a system and the louder we play music all creates energy, some of it is good, but too much of it gets in the way. Acoustic steel controls the energy by preventing vibrations from the floor getting to the speakers or vibration from the speakers getting to the floor. 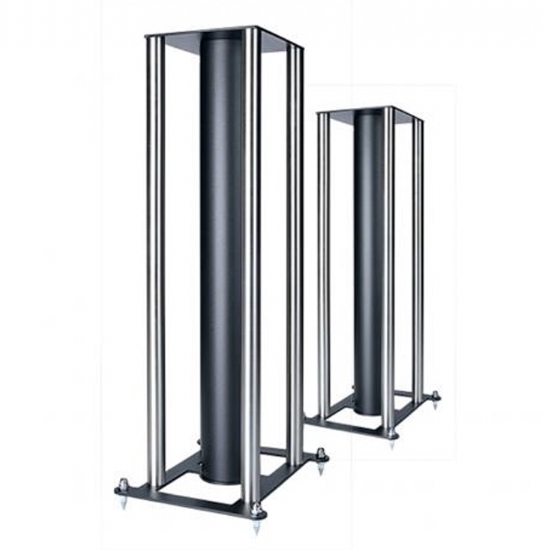 Replace a basic pair of speaker stands with a pair of the SF104 Signatures and your speakers will come to life with increased transparency, improved timing and more rhythmical drive. It’s not a subtle upgrade. Mass loading the centre column will enhance this further, controlling bass extension and reducing bloom with gives the speaker more air and space. So, you’ve got a good system, you’ve put it on a Custom Design Milan Reference Table, it looks great, it sounds great, but there is still more to come in performance terms. By installing some Stillpoints under each of the components in your hi-fi you are effectively eliminating a direct path between the component and whatever it sits upon. As a result of this the noise floor is mechnically lowered enabling you to hear more information in the music you are listening to. By doing this we get an increase in dynamics, heighten transients, increase the amount of air and space resulting in a much more musical and natural presentation.